Can you kick it far?... Yes you can with the KC Sport & Social Club. Come play in the only leagues in downtown and midtown that use a full softball field for games, use an easy to handle 8.5 in ball, and provide paid officials who are professional and knowledgeable for games. Join us in the upcoming season to get active and participate in that game we all enjoyed during recess. Our Coed adult Kansas City kickball leagues are offered on multiple days during the week, so simply choose the day that works best for you. KC Sport & Social Club offers adult recreational sports leagues in the Midtown and Downtown area. Leagues are affordably priced, and provide sponsor bars for players to hangout and socialize at after games. 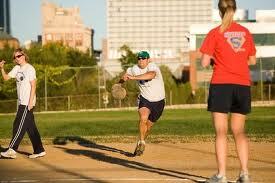 Sports include Kansas City kickball, softball, flag football, and sand volleyball! Some companies send employees on retreats. Other businesses utilize seminars. One thing is sure though, companies are looking for ways to build morale, and a sense of unity in today's tough economic climate. Sports have become an important, and cost effective way, to emphasize the team concept in the workplace. However, in order to get the most out of our recreational sports experience, organizations should set guidelines for those employees who choose to participate in these activities. 1. Employees must remember that they are representing their companies. Their behavior during Kansas City kickball games should always reflect that, even in the face of poor behavior by the other teams. 2. Teams must pick sports carefully. 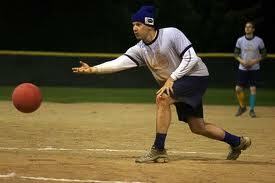 If the team is composed of in-shape and athletic employees, sports like softball and flag football may be a good fit. If members of the team are just looking to get some exercise, teams should look into more recreational sports like Kansas City kickball and sand volleyball. Also, teams should make sure to check the competition level of the league that they choose to compete in. Don't play in the wrong division just because it falls on the most convenient day for the team to play. 3. Check to see if your league provides team uniforms (t-shirts will do). Teams feel more of a sense of unity when they are all wearing the same uniforms. 4. Even if a company won't pay for the entirety of leagues fees, it may pay for a portion. Check with your health and wellness coordinator to see if your team qualifies. 5. Check with your HR department to check to see if the players on the teams need to sign participation waivers. Many times corporations will not sanction teams play unless all the participants sign waivers. Participating in team sports with your co-workers can be a rewarding experience. In the kansas city area there are plenty of leagues available. Check out our league registration, tournaments and events pages for more information on forming leagues. When you participate in KC Sport & Social kickball, you aren't just signing up to play a recreational sport. By joining us and the preferred coed Kansas City kickball leagues, you are joining a complete social network. We play together, party together and even help out charities. Our division sponsor bars are packed with kickballers after our game nights out, and many times there are other teams there as well who may not have even been playing that night. As in baseball, teams alternate innings with one team on the infield attempting to score by having its players circle the bases and the other team is in the outfield working to stop runs from being scored by getting outs. Players in the infield kick an inflated rubber ball in order to advance players around the bases and thus score runs. The team with the most runs after a predefined number of innings wins.